This comparison of rural development in India and the United States develops important departures from economic and historical institutionalism. It elaborates a new conceptual framework for analyzing state-society relations beginning from the premise that policy implementation, as the site of tangible exchanges between state and society, provides strategic interaction among self-interested individuals, social groups, and bureaucracies. It demonstrates how this interaction can be harnessed to enhance the effectiveness of public policy. Echeverri-Gent's application of this framework to poverty alleviation programs generates provocative insights about the ways in which institutions and social structure constrain policy-makers. In the process, he illuminates new implications for the concepts of state autonomy and state capacity. The book's original conceptual framework and intriguing findings will interest scholars of South Asia and American politics, social theorists, and policy-makers. 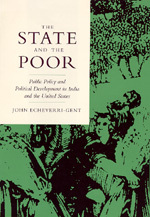 John Echeverri-Gent is Associate Professor of Government and Foreign Affairs at the University of Virginia.